Thank you for the thoughtful comments on the last post. It’s really interesting to read other people’s perspectives on comments, commenting and motivation for blogging. It’s given me a lot to think about. Changing the subject completely, I’m always interested to see how finished projects fare down the track. Often a project’s blogging life ends soon after the project is finished, which means you don’t know whether the item got much use and what improvements would be made if it was made again. A recent epiphany about a finished project has provided the motivation to start a periodic ‘where are they now?’ series. 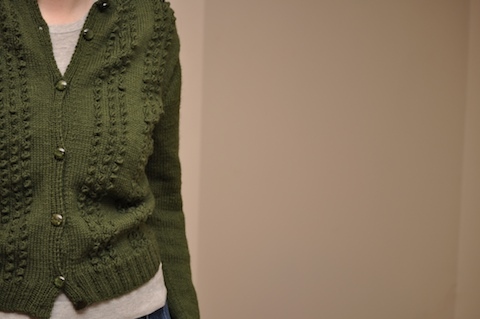 My Tyrolean Cardigan was finished about a year ago, but it’s only been worn a handful of times. I decided that the button band was the reason I wasn’t wearing it very often – I wore it to work recently and found I fiddled with it a lot. The button band was originally worked as in the pattern – seven buttons, with two spaced close together at the top and bottom. In this configuration, the front gaped a little, even though there was enough fabric to cover me. The buttons at the top and bottom were also largely redundant because I wore the cardigan with only the middle buttons done up, to help it nip in at the waist more. A few potential solutions came to mind, but I ultimately decided to pull out the button band and start again. This time, I added an extra buttonhole and spaced them out more evenly. This required a bit more surgery than anticipated, as the neckband needed to be reknit as well. I’m pleased to say it’s a lot more wearable now. It was taken for a test drive yesterday and I didn’t fiddle with it at all! Adding the extra buttonhole made all the difference, which is unsurprising given that the body was knit a bit longer than specified in the pattern. 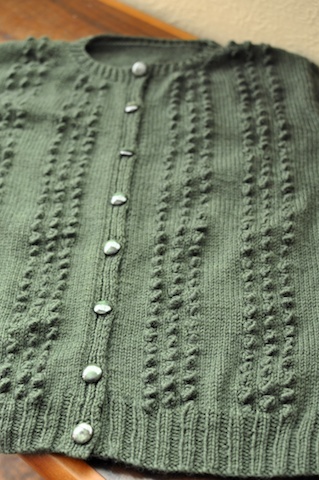 As for the rest of the garment, I still really like the bobbles, the colour and the button choice. Being a very warm cardigan, it’s coming into its own now we’re on the Winter side of Autumn. Probably most importantly though, the fabric is holding up ok. There’s a bit of pilling under the arms, but as the rest of the cardigan is remaining pretty much pill-free, I’m reasonably satisfied with how it’s wearing. Great idea! At SnB last week we were saying that all this kind of info needs to get onto Ravelry, so we know which yarns pill and which patterns sag. That’s a lovely simple solution to make your cardy more wearable. Congrats on both thinking and acting on it, we can all do with having useful items in our wardrobe especially those that have had a lot of work put into them. It’s a shame the first version didn’t work out for you but excellent that the issue is now solved. Great idea. Wearability is important and unknown when we say ‘YAY it’s finished’. I agree – it’s a great idea. And congratulations on making your cardigan less ‘fiddly”. Well done. oh good on you for re-doing the band. I have a cardigan that could use that but I’ve never had the stomach for it. And you’re quite right, where are they now is something we should see more of on blogs. Some garments don’t do so well and it’d be great to know why. It looks even lovelier on you in person!! Oh this is so lovely – looks great on you and the colour is perfect. I want one – now! – and this despite the fact that it’s about 25C in London today (which for London is very hot indeed.) I always wonder what happened to people’s knits and how they worked out so I love the idea of this post.